It took us a number of years to track down Hazel & Steve from Rymshott kennels. Thanks to the help from their friend Margaret who put us in touch with Rymshott kennels. Flip is full of some of the UK most sort after kennel names. Hazel & Steve got this dog’s name spot on he’s a “CRACKIN DOG” and we’re stoked to have a dog of this quality come to us here in Australia. 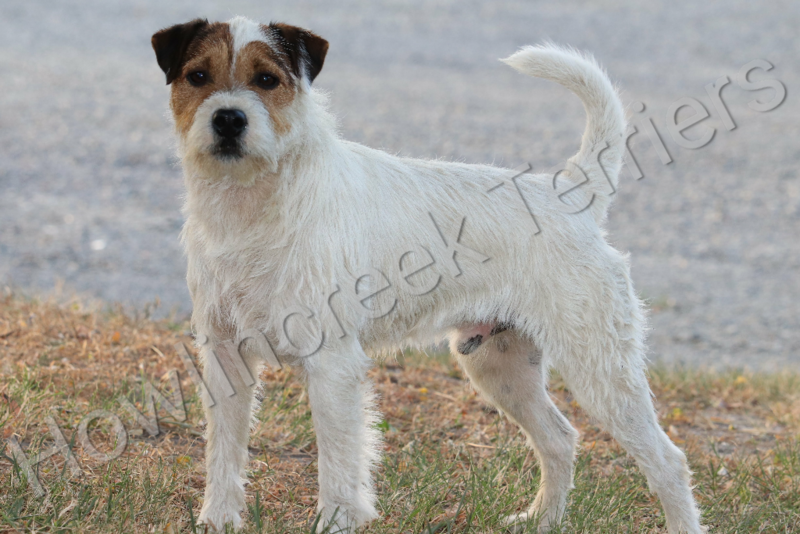 Flip is a rough coated dog with a white and tan head very alert sparkling expression with the deepest darkest almond shaped eyes with ears set on well. Lovely overall outline correct for size standing at 15 inches with correct scissor bite, good reach of neck, clean muscular shoulders down to plenty of bone and tight feet. He is easy to span with a good harsh rough coat and a loose pelt, good hind angulations and well-muscled. He holds his tail well and has a free flowing active workman like action.